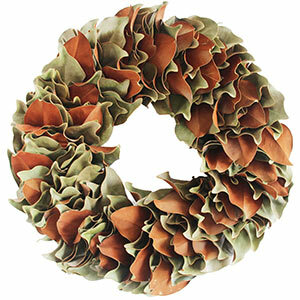 Our fresh Magnolia designs are hand-made leaf by leaf from our family farm in Florida. 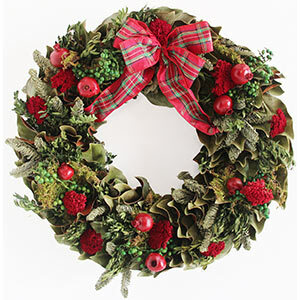 The fresh wreaths, swags, mantelpieces and garlands begin their aging process once shipped. To prolong their freshness, keep away from sunlight, moisture and heat sources. All our products dry naturally once hung or displayed. 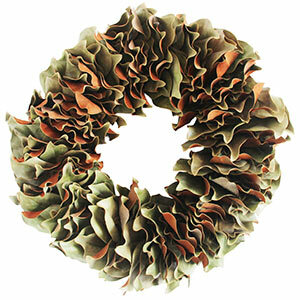 Our magnolia wreaths bring a natural feel to the interiors and can become a permanent home accent piece. Some of the pieces we have hanging on our walls are over five years old and are still classic beauties. Avoid moving your fresh design once it is completely dry unless placing in the custom box provided for future use. The garlands are to be used for one season only and cannot be stored. Our dried Magnolia products are hand-made leaf by leaf as well however, they are dried to perfection and given a light coating for a rich green hue. 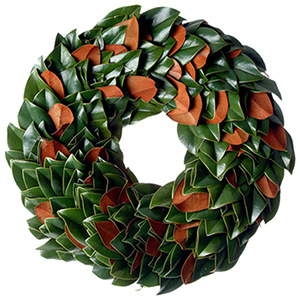 We recommend you display the dried wreath (swag) indoors because of the delicate nature of the leaves. If hung securely, your dried design will become a permanent home accent piece and can also be stored in the study two piece box provided. 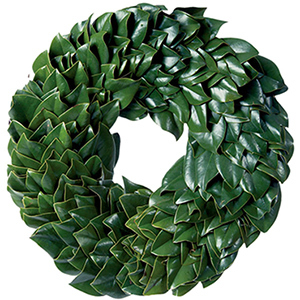 Listed below are conditional responses that our magnolia wreaths exhibit under different levels of sunlight exposure. 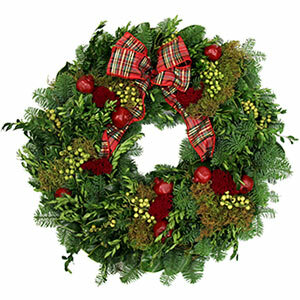 To extend the life of our products, our decorations should always be displayed out of direct moisture. Out of direct sunlight, the green leaves will stay a light green color fading to a pastel green as time progresses. In direct sunlight the green side of the leaves will change to sandstone brown to rusty brown over time. In cold environments - single digits (fairenheight) – six to eight week drying cycle. No problems with freezing. In cool environments (average of around 60 degrees F). Four to six week drying cycle. In warm humid environments (average of around 78 degrees F). Three week drying cycle. In warm dry conditions (indoor with the heater blasting) – Ten to fourteen day drying cycle. Because our products are made primarily from broad leaf evergreens the drying sequence is most notable in this setting. What happens in this drying stage? The leaves are alive and are transpiring the water that is left in the stems. Once we harvest the stems from our farm, we have cut off the leaves water supply, but they continue to use up the remaining amount of water until they dry out. Cooler conditions slow the leaves transpiration rates and this is why the drying sequence is prolonged. Lisa Apen of Apenberries Garden Shop jokes with her clients that during the initial stage of this product curing cycle the magnolia decorations are in “The Ugly” stage. Yes, we were appalled when we heard her describe our products that way, but we will admit this is our least favorite of the curing stages. However, this is just part of the natural drying cycle that we must endure for our products to finish off into timeless, classic decorations for your clients to appreciate for many seasons to come.